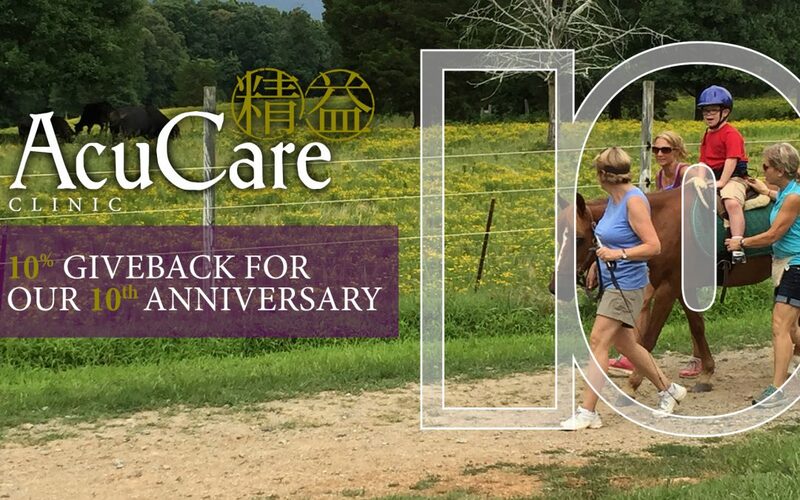 In honor of its 10th anniversary this month, AcuCare Clinic in Denver will donate 10% from each acupuncture treatment in September to Shining Hope Farms. AcuCare Clinic is an acupuncture and herbal medicine practice serving patients in our area. AcuCare Clinic opened its doors on September 15, 2008 with just owner and licensed acupuncturist Abe Rummage and his office manager Debbie Hopper. In the decade since then, the clinic has grown tremendously, now offering a variety of services to help patients, all under one roof. In June of 2014, AcuCare Clinic tripled its space by moving to the brick building in front of Safari Miles restaurant. AcuCare Clinic is home to a second acupuncturist (Jim Westmoreland), a chirorpractor (Dr. Jennifer Noonan of Well Body Chiropractic), a personal counselor (Rachele Caputo of Youtopia Counseling) and a massage therapist (Gayla Juarez), while Debbie still manages the entire clinic. AcuCare Clinic is the only area acupuncture clinic with a strong relationship with the medical and healthcare community. We have worked diligently to close the gap between traditional and alternative healthcare so both can work in unison and in the best of the patient — you. September appointments are quickly filling up, as patients are excited to be part of this anniversary fundraiser. Call Debbie today at 704.483.5441 to reserve your spot! The office is located at: AcuCare Clinic 388 N Highway 16, Denver, NC 28037. Questions? Send an email to info@acucareclinic.com. Please connect with AcuCare Clinic on Facebook and let them know how Shining Hope Farms has helped your loved one and why a fundraiser such as this is important.